It was looking grey this morning and the predictions were that it would rain, but not before around 3 pm. 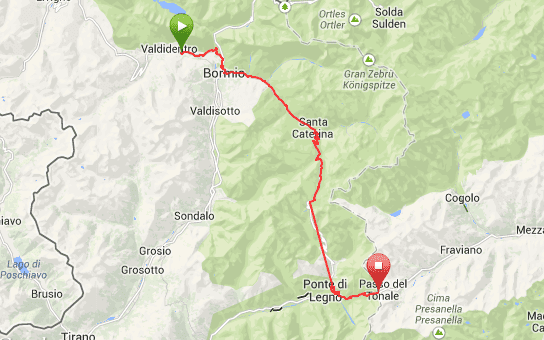 So, 9:20 sharp he was on his bike for the short descent towards Bormio, where the Gavia starts. The first 10 kilometers or so are not that demanding, but after Santa Caterina the fun begins. Not too bad, but just enough to force him to put on some extra clothes, which is never nice when in a climb – he sweats anyway and it cannot evaporate anymore. Besides, the temperature was slowly going down as well and towards the last 4 or 5 km the wind was chilling (and it was a head wind again of course). Nevertheless, the Gavia is generally speaking ‘pleasant’ from this side and maintaining a steady pace – albeit interrupted a couple of times to change clothes back and forth – he reached the summit with relative ease, keeping some reserve for the way back. At that stage he had already made up his mind about the descent: the bike was put on the car and after a coffee break, he and T. went down towards Ponte di Legno. Perhaps he should have returned immediately instead of climbing the Passo del Tonale first and he might have made it (or at least: once started, it would have been hard, if not impossible, to get him off his bike again). But since he had put his mind to adding this climb to the list as well, he dismounted the bike and started the almost 10 km long climb. Not a very demanding one either, but it was raining just a bit harder every kilometer or so and by the time he reached the summit, it was really bad. They had a great sandwich and a drink and waited some more to see if it would stop raining. When it didn’t, they went down to the starting point of the climb to the Gavia, where it was raining even harder. And by the look of it, it must have been stormy weather there, for there was a lot of debris on the road. So T. told our poor (self declared) hero that there was no chance in hell that she would allow him to climb back in the saddle again. Of course, he protested loudly and told her that both his friends at home would call him a wimp (and what not), but in fact he was not so convinced himself that he should. He’ll give it another shot one of the next days! Total for today: 44.2 km (no Gavia descend) / 2,128 altimeters. Report on 2015’s climb up both ends consecutively here.